We are only 2 minutes from the New Spar Theatre and a 24 hour Tesco store,and close to the Town Centre, There are two Beach where there is plenty of places for the children to play and have lots of fun. Good walks along very clean Beaches,And for the ladies lots of shops and for good food there are pubs on every corner of Town. There are miles of walks along the North Beach trail that go for 2 miles to Sewerby and 4 miles to Flamborough Head, and you can walk 2 miles South on the Beach to Barmston. Only recently refurbished property offering home from home comfort in this well equipped 3 bedroomed accommodation Sleeps 8. Near to Bus and Railway station. Entrance hall leading to Lounge / Diner with open Elect fire Digital 42"TV/DVD,Two piece suit and Two electric reclining chairs & settee, Large dining table to seat 6 and a Bed settee, leading to a fully Equipped Kitchen,with full cooker, microwave, leading in to Conservatory comprising of Fridge/freezer/washing machine. leading to the second Toilet. Two large double bedrooms one with cot (no bedding supplied for cot)and Digital TV, Main bedroom as a Digital TV, Small bedroom with bunks as a Digital TV. Family Bathroom with bath & over head shower wash basin and WC. Enclosed large private Car parking for a small Family car and play area to the rear. Gas combination boiler heating/Electricity/and all towels and bed linen are provided. Please note all SAFETY CERTIFICATES/FIRE TEST/ELECTRICAL and PAT TESTING/plus Carbon Monoxide Alarm in place and up to date. 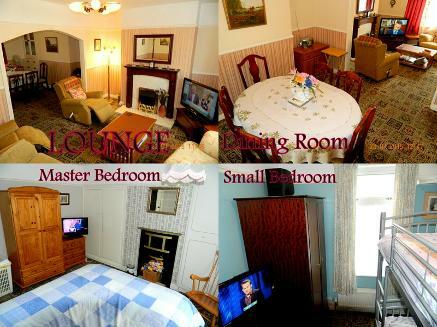 Short Breaks Availability in Winter & Off Peak times.